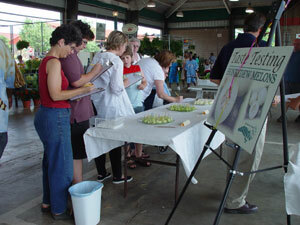 Honeydew Melon taste testing in Raleigh at the State Farmer’s Market in 2004. On July 16, 2004 personnel from the marketing division of the NCDA & CS held a Honey Dew Melon taste testing in Raleigh at the State Farmer’s Market. The survey consisted of three varieties of honeydew melons, two grown in North Carolina and one from California. People participating in the survey were asked gender, age, and number in household. They were then asked to rate the three varieties as to taste, sweetness and overall ranking. Finally, they were asked if they had purchased Honey Dew melons in the past and which, if any, of these melons from the test they would purchase.